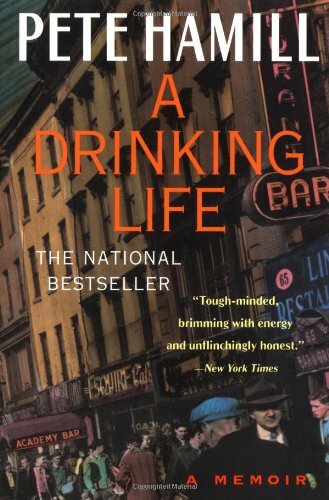 Order ‘A Drinking Life: A Memoir’ by Pete Hamill, available from Amazon.com by clicking on the book above! Look up the word “journalist” in any dictionary in New York City and you’ll probably see Pete Hamill’s mug staring back at you. The legendary newsman, a veteran of all three of the city’s tabloids, returned to the New York Daily News on January 1 for what he’s calling the “third act” of his long and storied career. But this time, instead of being on the front line, walking the streets in search of tomorrow’s headlines, Hamill, 61, is one of the suits, dispatching a new generation of Hamills, Breslins and Ephrons to the streets, subways and alleys of the Big Apple. He certainly picked a primo time to accept this particular job. competition from a city edition of Long Island’s Newsday. The News has endured long after its critics wrote it and the city’s other tabs off as relics of a bygone era. • A redesign by Milton Glaser (best known for his art direction of New York magazine) and Walter Bernard. • Full-color graphics, ads and photography should be a daily part of the Daily News no later than summer, appearing first in the Sunday edition. New presses in Jersey City, N.J., have already resulted in a crisper-looking paper with bolder photography and typography. • Multiple new teams of investigative reporters will dig into the grit, grime and corruption within the city’s gleaming exterior. Hamill, who was born and raised in Brooklyn, started his career at the New York Post in 1960, where he pounded out stories for 14 years. Since then, he has bounced back and forth among the tabs — including a few stints at the Village Voice — as if the city were a loud pinball game and his words carefully crafted, sparkling pinballs. He did three years as a News columnist and a few more as contributor to the paper’s Sunday magazine. Hamill rejoined the Post in ’88, only to leave when Rupert Murdoch acquired it for a second time. He also spent a year as a columnist at the late, lamented New York Newsday. More recently, he spent “five glorious weeks” as editor of the Post, a warm-up for his current gig. Having observed the city’s social and political changes across four decades as a newsman, as well as covering wars in Vietnam, Lebanon, Northern Ireland and Nicaragua, Hamill thinks the Daily News must immediately reacquaint itself with who its readers are now, not who they once were. He also believes the paper must reach out to legions of new immigrants who don’t yet see the relevance of the News in their lives. Besides, he says, today’s New York City doesn’t carry the same negative baggage it did just a few years ago. As such, he says the News needs to frequently remind New Yorkers what and where to do fun stuff in the city that never sleeps. “You can’t assume somebody who’s new here knows how to get to the Bronx Zoo or even what’s there,” Hamill says. Hamill’s thumbprint will eventually be felt across the News product, from the screaming front page headlines all the way to the back of the book, sports. Hamill recognizes his limitations, the paper’s and those of its readers. This is not the New York Times, it’s the Daily News, the voice of the working class, the subway straphangers and the man and woman on the street. For inspiration in the editor’s seat, Hamill says he’ll look to the recent and distant past. “My first editor was Paul Samm, who was executive editor of the Post for years. He kept the post alive when it was the seventh of seven newspapers in New York. He developed reporters such as Murray Kempton, Vic Ziegel and Nora Ephron. He knew that with a small staff, we could never send 30 reporters to where the Andrea Doria sunk. But we could do with style what we couldn’t do with sheer numbers. Taking on the editor’s seat at the News means many changes, not the least of which will be a drastic reduction in Hamill’s own literary output. Besides his trademark columns, Hamill is the author of eight novels. The best known is probably Flesh and Blood; the latest, Snow in August, will be published by Little, Brown sometime in 1997. On the non-fiction side, his struggle with alcoholism was revealed in stark detail in the 1993 memoir, A Drinking Life, which won critical raves. And he’s finishing the text for an art book about Diego Rivera, which will be published in ’98.